But the competition for my takeaway spend is huge. And nowhere more than amongst the pizza companies. So when this dropped through my door, it got me thinking. Here's what you see before you get to the menu. 8 offers; lunchtime, early week, all week, online, for families, for individuals, for collection and delivery. 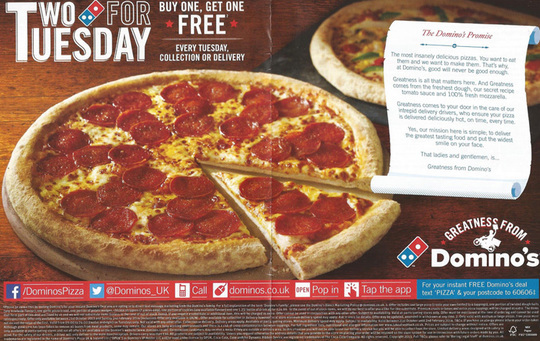 If Domino's marketing department is worth its salt, they're testing every single one. Because if they're not, they're leaving dough (sorry) on the table. So what's good about this side? Lots of different ways to order - the more ways you give people to get in touch, the more that will. Although I'd have started with phone, web and shop. Not Facebook and Twitter. I think they could have shown a better, more enticing pizza though. Don't you? Compare this pitiful pepperoni with the far more appealing pizza on the front cover. Looks a lot nicer doesn't it? And what on earth is the wheelying scooter rider, menacingly waving a pizza box all about? He's certainly not the chap I want delivering my dinner. Do they actually employ such hooligans? 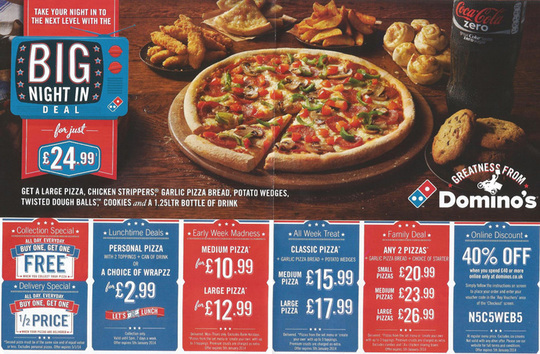 But the piece on this page which - hands down - wins my wrath is The Domino's Promise. After all, what does a pizza have to do with losing your marbles? But at least it is a promise of sorts. For goodness sake. These people aren't delivering under enemy shelling. Or at risk from snipers. They're bringing my food to my house. I know people say the area's gone downhill a bit recently ... but intrepid? Really? Now what about your marketing? ... or are you banging on about your intrepid delivery drivers? Maybe you'd like my help? If you would - and it can be with any part of your marketing - just email me. You won't get a stream of autoresponder messages. Just me getting in touch with you. And please remember, you're not committed to anything if you do.